What are Algerians demonstrating for anyway? Algeria has experienced something of an intellectual lost decade in the 2010s. The press was heavily censored, no serious economic analyses or reports are available on the country, no serious social studies are made and investigative journalism is not the norm. This by the way could be said about just about any other country. In Algeria like in many other countries, including Western democracies, quotas were placed on invited guests, meaning that a guest could not be invited more than, says, twice a year, unless hired by the broadcasting network or newspaper. This, and other factors, has led to a generation of people incapable of clearly expressing their claims when demonstrating. The literary scene is also something of a non-event in Algeria, the few book stores that used to exist went out of business, and bestselling books tend to fall into four broad categories: the nationalist type of books (mostly books about the Algerian war of independence written by independence fighters) along with religious types of books (Quran and commentary on the Quran) along with the Marxist types of books (Chomsky and the like) along with Western novels. Algerians who read one or two books a year are few and far between, those who read one or two non-fiction books a year are ever fewer and further between. Algerian politicians and high profile businessmen are part of an elite, and have access to all kinds of healthcare, social and political privileges. Their children study overseas, their families shop overseas and their families get healthcare treatment overseas. High profile politicians and businessmen, in their rare public appearances, seem not to be able to express themselves clearly and coherently, nor do they seem to be competent on the job. Government meetings are only held once or twice a year, high profile businessmen and politicians don't seem to know what tasks their job involve, nor are they up to the task. Algerians want politicians and businessmen who can get the job done. And if they can't, they should resign. What is the real structure of the government? Who are the men who really rule the country? What happens behind the scenes in business or politics? No one knows for sure, and people can only speculate. Algerians want more transparency and want to know who takes decisions, why and how. Political or non-political associations don't really exist, and when they do, they are rarely promoted, have trouble raising funds, rarely last for long. Algerians want help promoting political and non-political associations. Sports other than football for example have close to no coverage in the media, while leisure or business associations are not covered in the media and have trouble finding members. The press is heavily censored and almost everyone has a story about trying to get a story in the press and failing to do so. The press censors all political and non-political debate, and tends to depict Algerians as miserable. Algerians want freedom of the press, and a press that reflects the daily realities of the country. Starting a business is very complicated in Algeria, so is finding a job. Operating a business is an opaque deal and no one knows for sure what the rules are. Jobs pay very low wages, and few firms hire on a regular basis. Algerians claim that all their elections have been rigged and that results are rigged. Algerians want free and fair elections where candidates’ debate on clear platforms and the best candidate wins. Any politicians who posed for a picture with a Jew are sure to lose an election. 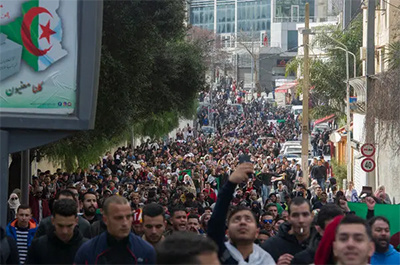 Algerians don't want any type of meddling with their political process, and any declaration from a foreign leader and intervention by a foreign presence can cause outrage and chaos. Algerians also don't want leaders who were born outside Algeria, and there are rumors all the time about high profile Algerian politicians being born and raised in Morocco, and actually being Moroccan. Algerian hospitals, banks, court houses, schools and universities are understaffed, hygiene is poor, you have to wait in line for hours, administration is chaotic and the services are chaotic. Algerians want more funds into their social systems. Algerians want financial transparency and want those who stole money to restitute the money they stole. Will the “revolution” work out? There's a saying that any idiot can tear a building down but it takes an architect to build one. Any people can take their government down, but it takes governors to rebuild a government. Most Algerians are elitist when they can; most are opaque when they can, most would go get healthcare services abroad if they could, most would be corrupt if they could, most would rig elections in their favor. The absence of social networks in the country (I mean political social networks who know each other and interact with each other on a daily basis) along with the absence of political, economic or social culture (there's only one book store left in the city of Algiers, and last time I went there, they hadn't sold books for days) probably means that there can be nothing good that comes out of the “revolution”. The departure of Bouteflika kind of reminds me of the death of Boumediene in Algeria. Most of Boumediene's cronies were purged, either sent abroad as diplomats or altogether sent away from politics, before they all came back 20 years or so later. That's probably what will happen. New faces will emerge, and today's faces will resurface in 20 years' time.